Julie is our operations manager at Tampa Bay Institute of Oral Surgery and Dental Implants, overseeing the clinical and administrative staff in all of our offices. Originally from Farmington Hills, Michigan, she grew up in her father’s successful oral surgery practice located in Dearborn. Julie assisted in her first major surgical procedure at 13 years of age. Minus the time spent in college, she has worked in the field of oral surgery and dentistry since that early age. Julie moved to Palm Harbor, Florida in 1993 and spent eight years working for a nation-wide dental group during their major growth phase. During her time with them, they grew from three locations to over 300. She has spent time in upper echelon private practices that specialized in full mouth reconstruction and also spent eight years working in a group practice alongside specialists and general dentists, including oral surgeon Dr. Renato Aves (founder of Tampa Bay Institute of Oral Surgery and Dental Implants), orthodontists, and periodontists. Her experience is very broad, and she is familiar with all aspects of our profession. Julie is passionate about oral surgery and firmly believes every patient deserves to make informed decisions. You will often find her reviewing complex cases with patients to making sure they understand their present oral condition, their goals, and all the options that can help achieve them. During her free time, Julie enjoys traveling with her loving husband, Tom. They travel to see their family often in Illinois, Ohio and Michigan. 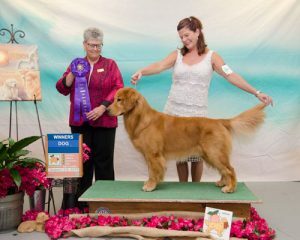 Very occasionally, Tom and Julie breed Golden Retrievers and show them at AKC dog shows around the country. Currently they share their home with 11-year-old Fly Girl, 8-year-old Puccini, and 2 year old Ditto.